More apples in the background. With the colors I used on this card, it kind of reminds me of Fall. I would be OK with just skipping from Spring to Fall in Florida....it just gets soooooo hot in the summer. Playing today in more challenges. Dots were inked with Kaleidacolor Creole Spice.Metallic variegated embroidery thread was used behind the sentiment, and of course my favorite Pico Wedding Dress dots. Love how this turned out! I wouldn't have thought to use these colors together for a bokeh affect. Thanks for the inspiration! I am so far behind on commenting on your blog - so sorry!! Going to work on getting caught up!! You have been so busy!! 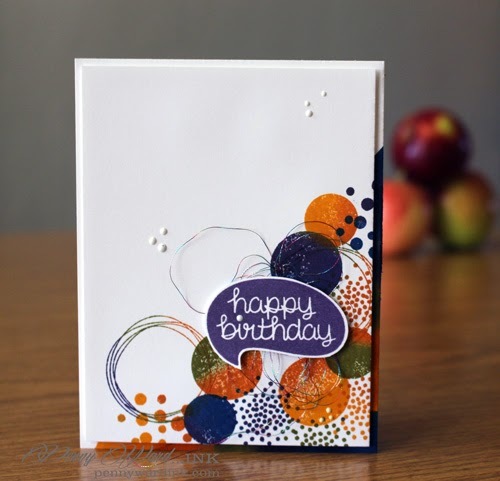 This card is lovely and your bokeh style has been done with some beautiful, deep colors!! 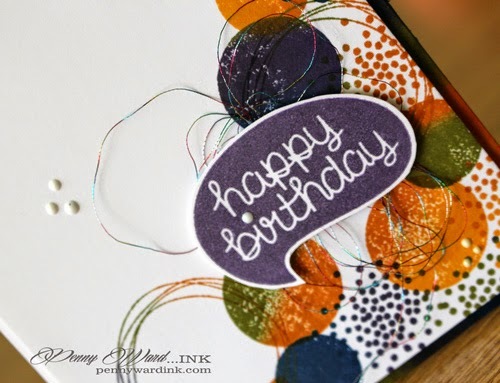 Love that happy birthday sentiment! !